UW–Madison is pleased to make available a site-licensed instance of Guidebook: UW Guide. Guidebook allows the creation of mobile “mini-apps”, known as guides, for meetings, conferences, events, tours, attractions, and so on, via an easy-to-use web interface. Guides can contain schedules, programs, maps, information, documents, and more. UW’s branded instance of Guidebook is called UW Guide. 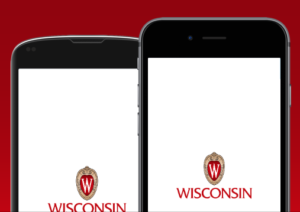 Guides may appear in either the UW Guide app, the Guidebook app, or both for download, and updates or changes are automatically applied on the fly for users. Private guides can also be created for private or targeted events. The campus license removes a large portion of the cost, as well as giving Guide owners and users a consolidated, one-stop, branded app in the app stores, with unlimited downloads and unlimited updates. Each new guide has a cost of $1500, renewed annually for recurring or ongoing events or programs. This service provides the Full Service guide functionality. For more information about Guidebook applications in university settings, visit Guidebook College and University Apps. Contact mobile@doit.wisc.edu if you are interested in UW Guide! Down load UW Guide today!